More than I would like. Still. Next month is Plastic Free July. This is a month where normal, everyday people are encouraged to take the pledge to give up single use plastic, takeaway items, or dispense with the stuff altogether. The second being my own commitment to abolishing the use of plastic – what can be improved, what I’m failing at, why I’m not 100% there. Notice that my thoughts rarely detail the achievements I have made in my quest, those small sweet victories. Funny how the human mind doesn’t quite work that way. I’ve been having a lot of instances lately, where I’ve wondered why I’m bothering making the effort. This is all outside of the blog – I’m lucky to have found a community of people who have similar sentiments to my own and for that I feel very grateful. Yet outside this bubble world, you realise just how much work needs to be done. People just don’t care. Or, they’re more interested in convenience. And I understand that pledging to not use plastic does bring a lot of inconveniences with it and that can be a deterrent for some. But once again – people just don’t care enough. We get stuck in our ways, lost in our routines and habits. And then I start to feel rebellious, thinking Why am I making so much of an effort then? I have in many cases denied myself an item (usually food) because I don’t want to deal with the packaging. I once refused to buy chocolate in Switzerland because they wouldn’t let me use my own bag. Let me tell you now, that was a sacrifice and a half. Sometimes I’ll cave and get takeaway, which leads to feelings of lingering guilt for hours/days/weeks. I still buy sour cream in plastic containers every month because it is one of my favourite foods ever (although I do hoard the containers and use them for other purposes). The strong support of a cause can lead you to some dangerous places. I mean, wars have been started over other people’s belief systems. Your cause could do more harm than good. Yet, surely the desire to take care of the planet isn’t a bad thing? At the very least, it seems like the obvious thing to do. Happy planet + us taking care of it = beautiful things and longevity for our race. Abusing the planet at the rate we currently are… well, who knows what could happen. I get mighty sick of the people in positions of power making soft decisions where this very important cause is concerned. Like that fact that only three states and territories within my own country have banned the plastic bag (Northern Territory, South Australia and Tasmania. You are all winners). Or how we have neglected our responsibility to our beautiful reef, instead supporting what is rapidly becoming an archaic form of energy supply. Decisions are continuously being made that will benefit few in the short term and none of us long term. And we willingly go along with. So, it’s easy to become despondent. To believe there is truly no point in trying. To simply give up. And I regularly have this conversation with my family and friends, that centres around: “What can we do?” There’s so much that is wrong with my country. There is so much that is wrong with the world. Do it for the birds. What can you as one person, do to change the world? Quite simply, you do what you need to do. That thing that keeps you awake in the night, that makes you want to rage against the machine. Find out what that is and get involved. We have to believe in the sound of one hand clapping. Go to rallies and protests. Sign petitions. Connect with likeminded people. Take a look at your day to day habits and see what can be changed. When you step into the booth during elections, be informed about the consequences of your vote (and always vote – people literally died for this right, so don’t take it for granted). You can reduce your environmental footprint, just by changing a few habits. It’s easy. And how easy… well, that’s what I’m going to show you. I’ll also be sharing posts from other bloggers on my Facebook page. There’s a lot out of good’uns out there and they’re a valuable resource for anyone wanting to get started on their green journey. So, to sum things up – what’s the solution? I think it is to be the change you want to see in the world. It’s as simple as that. 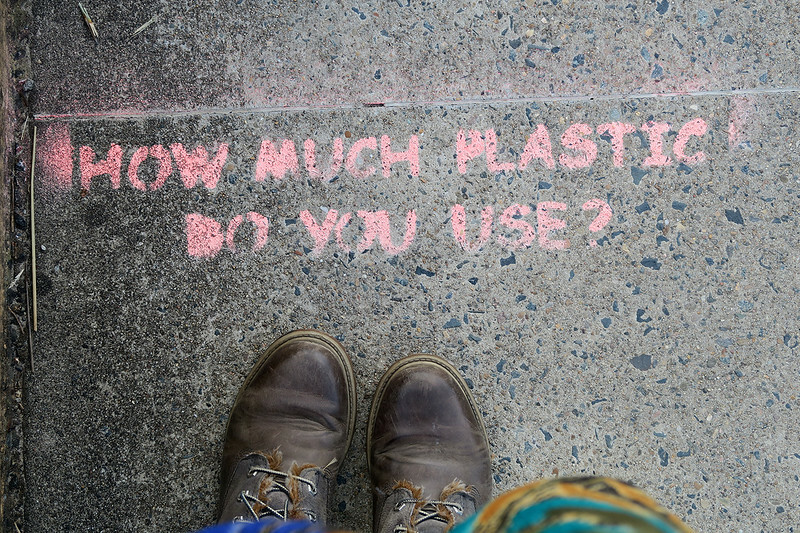 Will you be participating in Plastic Free July? Doooooo it. Exactly! Oh plastic wrapped stuff makes me so angry, especially when it’s bananas or avocado. NATURE HAS ALREADY WRAPPED THEM. Idiots. I wrote a huuuuge comment on this when you first published but my mobile is STILL having issues commenting so it didn’t work, and now I can’t really remember what I wanted to say! Unless I’m confusing it with a comment on a different post of yours, I think I wanted to tell you that I politely turned down Tesco’s offer of a little plastic baggie for my mushrooms, and the woman at the self-serve counter thought I was an alien. And then I wanted to ask you if you know of any alternatives to using plastic bags for loose fresh fruit and veg? I can’t be stuffing mushrooms in my pockets forever, and I’m scared to try with tomatoes. But it’s recently occurred to me – thanks in part to you! – how much plastic I’m wasting on my bi-weekly mushroom-run. I am proud of you! And still very confused by the mobile thing, particularly as I’m writing back to you in my mobile now and it seems to be working. Urgh. I carry small cloth bags around in my backpack for such an event. I got them online from a Spanish store, sinplastico. Although in Australia they offer paper bags for mushies and I don’t mind them as much as my worms can eat them. That really annoyed me when I lived in Britain, particularly how even the avocados and bananas in metro Tescos were bagged. I often had to forgo my smashed avo in the mornings, which was hugely upsetting.